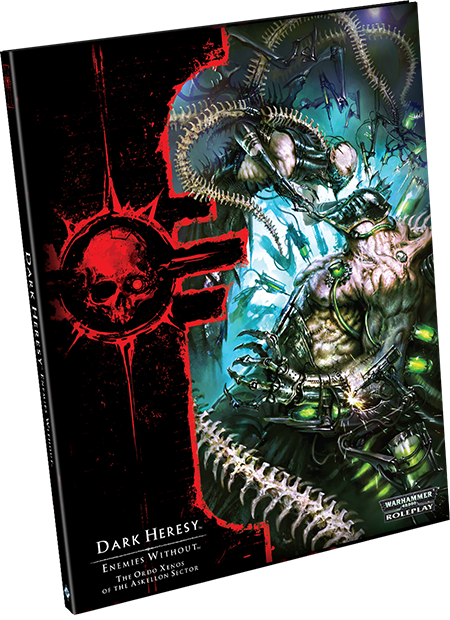 29 October 2015 | Dark Heresy 2nd Ed. The Askellon sector teeters on the brink of anarchy and chaos. Countless xenos attacks occur daily across the sector, even as the Faceless Trade smuggles proscribed artefacts past your nets and long-dead civilisations still threaten to corrupt the future with their heresies. As an Acolyte of the Ordo Xenos, you are the proud gatekeeper, the unyielding shield of the Imperium. You stand in the gap against Tau ideologies and Tyranid armies alike. Take up your bolter and hold fast for all Mankind when you pick up your copy of Enemies Without, now available online through our webstore and at your local United States retailer! 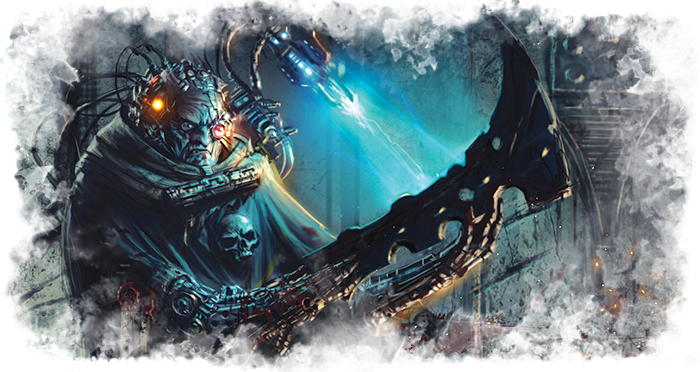 Enemies Without is a new supplement for Dark Heresy Second Edition, drawing you and your fellow Acolytes into another section of the Imperium’s ceaseless war against the darkness of the universe. As you battle ravaging hordes of Orks or oppose the senseless predations of the Dark Eldar, you can benefit from the new character creation options, weapons, and vehicles included in Enemies Without. For the first time, your Acolyte can specialize in the care and use of vehicles by becoming an Ace. In addition, Enemies Without features a host of information for the Game Master to understand the mind of the xenos races and bring them into any campaign. 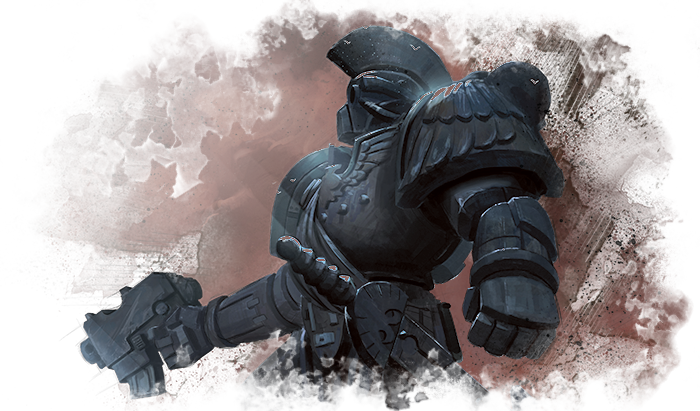 As a member of the Ordo Xenos, you fight to protect Mankind’s dominion for another blood-drenched day. You may battle massive hordes of biologically-engineered killing machines or seek to uncover and uproot the inner workings of the secretive Faceless Trade. You may investigate the ruins of fallen cultures that can still corrupt entire planets by their mere presence. You may pit yourself against the most dangerous leaders of the foul Tau Empire or seek to outwit the alien intelligence of the Eldar as they plot their unknowable schemes. The most radical Acolytes may even take up xenos weapons or hire the aliens themselves as mercenaries to further destroy these vile creatures that threaten the glory of the Imperium. The knowledge of these xenos races is utterly forbidden, and any trace of sympathy is punishable by death. Still, for you to better destroy the aliens that assault the Imperium, some additional investigation and knowledge, however distasteful, may prove necessary. Enemies Without introduces Explications to your Dark Heresy investigations, as Tim Cox explored in his designer diary. When you perform an Explication, you must set the parameters and target of your research. Then, as you make breakthroughs and examine ancient codexes, you’ll gain significant advantages that you can use to defeat the aliens that threaten and despise the shining light of humanity’s influence in the Askellon sector. In addition to a massive amount of information on the xenos that plague your sector and new rules for research and Explications, Enemies Without offers a unique focus on the vehicles of Dark Heresy. 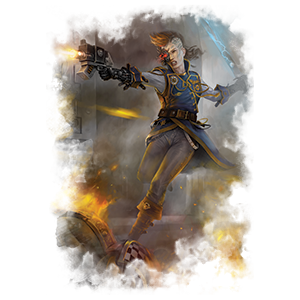 You may train your Acolyte to become an Ace, using powerful vehicles as an extension of your own body to quickly transport across hostile terrain or unleash terrible firepower on your foes. With new aerospace vehicles that allow you to travel between the planet surface and the mighty voidships, you add another dimension and another potential battlefield to any encounter. Whether you utterly devote your service to vehicles and the blessings of the Machine-God, or you simply see a vehicle as another way to get you to your investigations, you can benefit from the increased armoury of weapons and vehicles featured in Enemies Without. The xenos species of the galaxy wage an unending war against humanity, nibbling at the edges of the glorious Imperium like parasites. This is your war—to destroy the alien and see the banner of the Emperor set high above every planet in the galaxy. There will be no ceasefire. There will be no peace. Take up the sword of the Emperor’s justice and dispatch the alien back to the starry depths whence he emerged! Pick up your copy of Enemies Without at your local U.S. retailer today.